It's a taller succulent, and the branches are covered in a sort of bark. 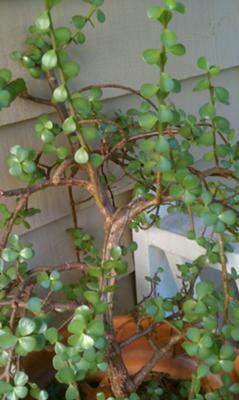 The leaves resemble a jade plant, but since this plant is taller and quite "branchy" I'm not sure what this one is! Any help would be sooo appreciated! I'm pretty sure that this plant is a very overgrown Portulacaria afra - the Elephants Food. It does resemble Crassula argentea, the Jade Plant, but in miniature. They respond well to pruning, and are easy to root as cuttings, so you could prune to shape, and make a little bonsai, rooting the pruned off parts to propagate more, if you wish. Otherwise, find an elephant to do this for you! Other interesting facts about Portulacaria afra is that it can be grown as a small hedge, in areas that don't get any frost, has small clusters of pink blooms when well grown in its native habitat in South Africa, and, to top it off, is fire retardant. See the page on succulent care and find out how to make a Crassula bonsai. The Succulent Plant Propagation will show you how to make more plants from cuttings, or buy the Succulent Plant Propagation E-Book.